The 1912 Villisca Axe Murders Blog: Fall River's Lizzie Borden and Villisca Ax Murder Cases Connected? Fall River's Lizzie Borden and Villisca Ax Murder Cases Connected? Sub-zero self-portrait circa March 1998. For film fans, yes, that's a classic Arriflex 16BL 16mm camera. The 1912 Villisca axe murder case is so complex and far-reaching that at times it seems to have connections to nearly everything. In fact, I recently threw down the gauntlet and challenged readers of this blog to suggest a subject that I would then attempt to tie to the unsolved mystery in Villisca. Someone suggested the 1892 Lizzie Borden hatchet murder case. At first glance the only connection between these two crimes seems to be in the choice the killer made at the hardware store...or at the murder scene(s). Yet, these two cases are connected by a thread, slender as it may be. In 1993 as we began to plan our documentary feature film project "Villisca: Living with a Mystery" we decided to film in Fall River, Massachusetts regarding the murders of Andrew and Abby Borden. Why? We knew the Borden case was more well-known, and we thought it might provide an interesting story to compare and contrast with Villisca's, particularly in terms of two turn-of-the-last-century communities and their collective response to a brutal crime and unsolved mystery in their midst. We shot interviews with local historians and other scenes in Fall River during the summer of 1994 (actually, we shot them twice, but I'll save that story for another post). Among these interviews is the last known one with past Fall River Historical Society curator Florence Cook Brigham. She vividly remembered seeing Lizzie walking Fall River's streets and she offered the kind of insights and observations that can only come from an "insider." We found there were numerous parallels in the communities' response. The most striking was the tendency local people had of talking freely about the murders among themselves, but giving outsiders making inquiries the "bum's rush." Ultimately, although we edited the Lizzie Borden segment, we chose not to include it in the completed documentary. 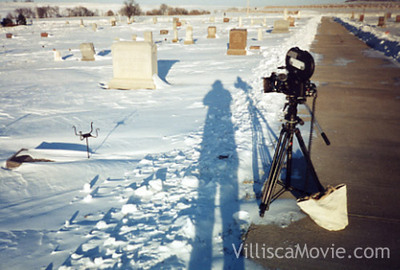 Instead, we added it to a series of "deleted scenes" on the "Villisca: Living with a Mystery" DVD. Not quite. John Vinnicum Morse is the tenuous connection between the two infamous and still-unsolved mysteries. Morse, or Uncle John as he is called, arrived in Fall River for an overnight visit with the Bordens on the day before Andrew and and his wife Abby were murdered. His incredibly detailed alibi for the day of the murders caused more than one eyebrow to raise regarding knowledge he may have had regarding an impending crime. In short, while some considered him a possible suspect, Andrew's daughter Lizzie was charged, tried, and acquitted. Morse moved to the Midwest when he was about twenty-years-old and settled in Hastings in Mills County, Iowa where he resided for some twenty-five years. He was a farmer and horse breeder and also owned interest in the Botna Valley State Bank in Hastings. Twenty years after the August 1892 crime in Fall River, an entire family of six and two visiting children were murdered with an axe in Villisca, Iowa in June 1912. In an effort to leave no stone unturned in a troubled and unsuccessful criminal investigation (and knowing Morse had been a suspect in the Borden case), Montgomery County officials took time to look up John V. Morse. Hastings is a mere 30 miles west of Villisca on Highway 34. Seasoned Bordenites will already know where they found him. In fact, I looked him up myself in March 1998 following a cross-country drive (I will also save this harrowing tale of terror for another time) to document the demolition of a historic building in Villisca. 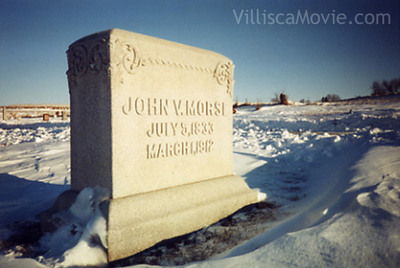 I found him where investigators found him in 1912--in a desolate Hastings, Iowa cemetery under a marker with the following inscription: "John V. Morse, July 5, 1833-March 1, 1912." He was summarily dismissed by Iowa officials as a possible suspect in the Villisca ax murder case. Thanks to Dr. Edgar V. (not Vinnicum) Epperly who contributed to the content of this post.